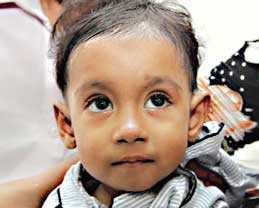 One-and half- year-old Munia is the daughter of Mintu Mia, a tailor at Bangorgati in Sonadanga of Khulna. A news report published on January 29, 2013, describing her ailment drew the attention of Bashundhara Group Chairman Ahmed Akbar Sobhan. He ordered his media adviser to take steps for treatment of the girl. Munia who was supposed to lead a sound life like other children could not recover due to poverty of her parents. Her father was unable to arrange her treatment. She is expected to undergo operation at Ibrahim Cardiac Hospital soon. He said he was anxious about the costly treatment of his daughter as he came to Dhaka on January 28, 2013. When he was returning home with his daughter next day without treatment for lack of money, he received a telephone call from Mohammad Abu Tayeb, Adviser (Press and Media) of Bashundhara Group, saying that the group will bear the cost of treatment.